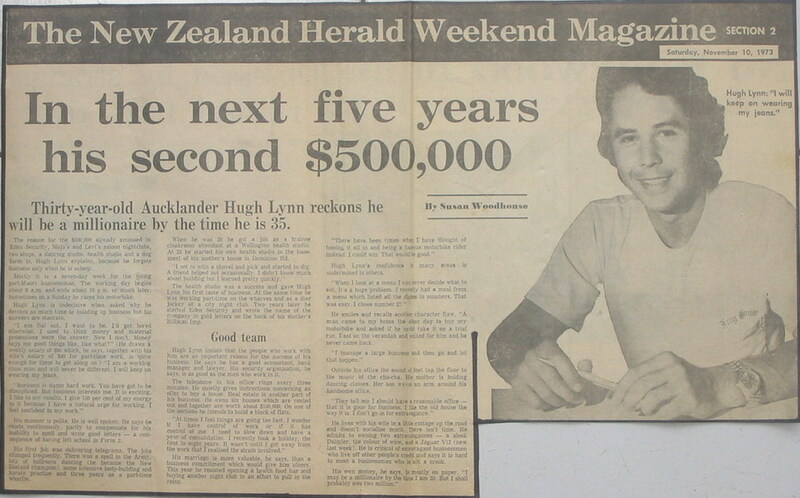 Thirty-year-old Aucklander Hugh Lynn will be a millionaire by the time he is 35. The reason for the $500,000 already amassed in Eden Security, Mojo’s and Levi’s saloon nightclubs, two shops, a dancing studio, health studio and a dog farm is, Hugh Lynn explains, because he forgets business only when he is asleep. Mostly it is a seven-day week for the young part-Maori, businessman. The working day begins about 8 a.m. and ends about 10 p.m. or much later. Sometimes on a Sunday he races his motorbike. Hugh Lynn is indecisive when asked why he devotes so much time to building up business but his answers are staccato. “I am flat out. I want to be. I’d get bored otherwise. I used to think money and material possessions were the answer. Now” I don’t. Money buys me good things like, like what?” (He draws a weekly salary, of $90 which, he says, together with his wife’s salary of $40 for part-time work, is quite enough for them to get along on.) “I am a working class man and will never be different. I will keep on wearing my jeans. His manner is polite. He is well spoken. He says he reads continuously, partly to compensate for his inability to spell and write good letters – a consequence of having left school in Form 3. His first job was delivering telegrams. The jobs changed frequently. There was a spell in the Army, lots of ballroom dancing (he became the New Zealand champion), some intensive body-building and karate practice and three years as a part-time wharfie. When he was 20 he got a job as a trainee cloakroom attendant at a Wellington health studio. At 23 he started his own health studio in the basement of his mother’s house in Dominion Rd. Hugh Lynn insists that the people who work with him are an important reason for the success of his business. He says he has a good accountant, bank manager and lawyer. His security organization, he says, is as good as the men who work in it. The telephone in his office rings every three minutes. He quietly gives instructions concerning an offer to buy a house. Real estate is another part of his business. He owns six houses, which are rented out and together are worth about $150,000. On one of the sections he intends to build a block of flats. His marriage is more valuable, he says, than a business commitment which would give him ulcers. This year he resisted opening a health food bar and buying another night club in an effort to pull in the reins. Hugh Lynn’s confidence in many areas is undermined in others. He smiles and recalls another character flaw. “A man came to my home the other day to buy my motorbike and asked if he could take it on a trial run. I sat on the verandah and waited for him and he never came back. Outside his office the sound of feet tap the floor to the music of the cha-cha. His mother is holding dancing classes. Her son waves an arm around his handsome office. He lives with his wife in little cottage up the road and doesn’t socialize much. There isn’t time. He admits to owning two extravagances – a sleek Daimler, the color of wine, and a Jaguar V12 (new last week). He is critical of extravagant businessmen who live off other people’s credit and says it is hard to meet a businessman who is not a crook. ~ by admin on 26 September, 2008.